The golden era of the Time Rice and Andrew Lloyd Webber union threw up musicals that have gone down in history as some of the best works of theatre ever. One such musical is the multiple Tony and Olivier Award winning Evita, which returns to the West End for a limited 55 performance run at the Dominion Theatre from September 2014. Evita is based on the true story of the Argentinean political figure, Eva Perón and her rise to power, capturing the hearts and minds of her people. 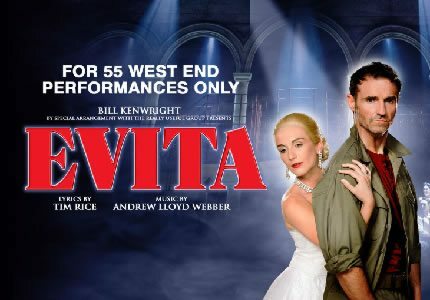 Having begun life as a concept album, Evita was adapted into a full scale stage rock opera in 1978 and opened to rave reviews at the Prince Edward Theatre. The show opens as news of Evita’s death is announced in 1952 Buenos Aires and is received with heartbreak and hysterics. The story then jumps back in time to reveal a 15 year old Eva in 1934 amid her first love affair and her big move to Buenos Aires. As the years pass, Eva climbs the social ladder by charming influential men and eventually becomes a famous actress. All is going well for the newly powerful and adored Eva until she is introduced to the world of politics and more specifically, the dashing Colonel Juan Domingo Perón. West End star Marti Pellow will take the role of narrator Che and Eva, a role made famous by stars such as Elaine Page, Patti LuPone and Madonna, will be played by Madalena Alberto. Evita will run for a limited time only at the Dominion Theatre, so buy your tickets to see this timeless classic now. Evita is not recommended for young children due to the themes and subject matter of the show. Children over the age of 10 may attend if accompanies by an adult.